Naomi came to teaching after a career in retail management. She is a fully qualified Montessori teacher, with a back ground in art and dance. She loves to combine her passion for meditation, chanting and yoga practise with teaching, so that each child learns to discover and grow for themselves and ultimately becomes autonomous learners. She has taught partner assisted classes for early years in central london, where each child is learning to discover the world through their senses. Naomi has been involved in teaching forest school to three years and has introduced mindfulness meditation to a nursery schools daily schedule. Naomi’s deep passion for children is based on a sense of discovery and wonder of the amazing potential we all have and a huge appreciation of this world we all share. 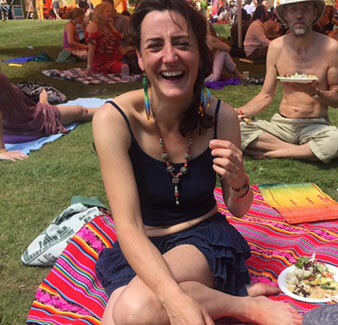 She co-ordinated the children’s activists at the sundara, 2017 camp and is delighted to be back to hold this space again, where she will help to bring a varied timetable of art, craft, yoga, dance, talent show to the kids area. She will be holding creative often really messy !! art spaces this year.